Put the rice into a large mixing bowl and cover it with cold water. Stir the rice with your hands, massaging it to release the starch. Strain the rice through a sieve and put it back into the bowl. Swirl the rice thoroughly and strain it again. Repeat once more. Now your rice is ready for cooking. Put the rice into a rice cooker or large saucepan. Add the water and kombu. If using a rice cooker, turn it on. If using a saucepan, cover tightly and set over high heat. When the water boils, reduce heat to very low. Let cook until all the water is absorbed. Turn off heat and let sit, covered, for 15 minutes. Remove the kombu from the cooked rice. While the rice is cooking, make the dressing. Put the vinegar into a medium saucepan and set it over low heat. Stir in the sugar and salt until dissolved. Remove from heat and let cool. Spoon the hot rice onto a sheet pan and immediately drizzle the dressing over it. Use a rice paddle or wooden spoon to gently stir the rice to coat it. Be careful not to mash or break the rice. Let the rice cool until it is just barely warm to the touch. Put the rice into a bowl and cover with a damp towel to keep it moist. To refresh leftover rice that has been refrigerated, sprinkle it with water, cover with a damp towel and microwave until hot and tender. In a small bowl, stir together the hand vinegar. Lay a sushi mat on a clean surface and cover with plastic wrap. Moisten hands with hand vinegar and shake off excess. Lay 2 pieces of roast beef on the mat to cover it. Sprinkle with some chili powder and ¼ of the garlic, rubbing both into the beef with your fingers. Cover the beef with 1 cup sushi rice, leaving 1 inch empty at the end farthest from you. Zest the limes and sprinkle ¼ of the zest over the rice. Squeeze a little lime juice over the rice as well. Sprinkle the rice with cumin seeds. Arrange one quarter of the jalapeno and scallion strips, two cilantro sprigs and a sprinkling of cheese along the center of the rice, crosswise, covering the half of the rice that is closest to you. Securing the jalapeno, scallion and cilantro with your fingers, use your thumbs to push the end of the mat up and over the filling, until the one edge of the rice meets the other side. Press firmly on the roll to seal and shape. Lift up the top of the mat and roll firmly until tight and round. Squeeze gently to shape the roll. Press the ends in carefully to secure any loose rice. Remove the bamboo mat, peel off the plastic and set the roll aside. Repeat with the remaining ingredients to make four rolls. 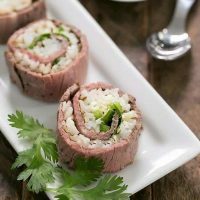 Slice each roll into six rounds, arrange on a sushi platter and serve with pico de gallo or salsa.